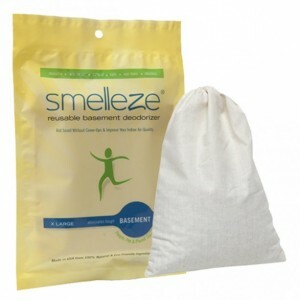 SMELLEZE Natural Formaldehyde Spill & Odor Absorbent Granules: 25 lb. 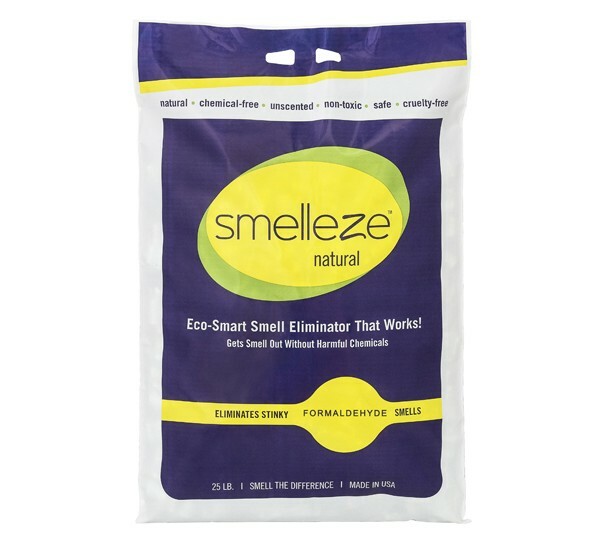 Bag Summary Smelleze® Eco Formaldehyde Remover Granules removes formaldehyde spill & odor without masking with harmful fragrances and provides formaldehyde pollution control. Safe for people, pets & planet. This eco-friendly formaldehyde odor remover deodorizer really works. Features & Benefits • Simply sprinkle & smell the difference • Removes formaldehyde smell instead of masking it • Eco-friendly, safe, non-toxic, natural, odorless • Significantly improves indoor air quality • Can be used to absorb formaldehyde odors & spills • Made in USA Formaldehyde can cause Cancer Formaldehyde, a colorless, pungent smelling gas, is in widespread use in products such as particle board, insulation, plywood, laminates, cosmetics, dyes, smoke, fertilizers, fiberboard, filters, leathers, paper, plastic, rubber, textiles, etc. and can be emitted from them because it vaporizes at room temperature. In addition, formaldehyde is used in products such as embalming fluids, fuels, fungicides, adhesives and paints which can result in spills. Medical problems associated with formaldehyde exposure include watery eyes, burning sensations in the eyes and throat, nausea, and difficulty in breathing. High concentrations may trigger asthma attacks. Some people can develop chemical sensitivity after exposure to formaldehyde. Formaldehyde is also a known to cause cancer. For a breath of fresh air, simply sprinkle Smelleze® Formaldehyde Smell Removal Granules on the spill and sweep up after the spill is absorbed. Smelleze® Formaldehyde Odor Removal Granules will contain dangerous formaldehyde spills and cleanse the air of odors, complement existing ventilation systems and create a safer environment. 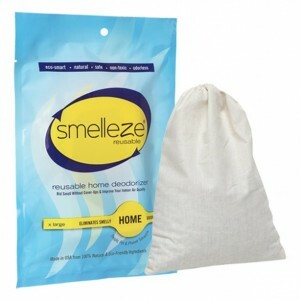 Smelleze® Formaldehyde Smell Remover Granules are non-toxic, safe, natural, odorless, non-flammable and non-caustic. Smelleze® Formaldehyde Odor Remover Granules is an ideal environmentally friendly solution for eliminating dangerous formaldehyde spills and odors without adding pollutants to the air you breathe. It does not contain VOCs, harmful or ozone depleting chemicals and is especially beneficial for those suffering from allergies and chemical sensitivity. No fossil fuels are used in the production of Smelleze® odor eliminator deodorizer media.